Happy New Year! There’s always lots of talk at this time of year of dryanuary, detox, diets and now veganuary. I don’t subscribe to any of these, so no diet recipes here my friends. What I hope to continue to deliver is simple, tasty recipes. 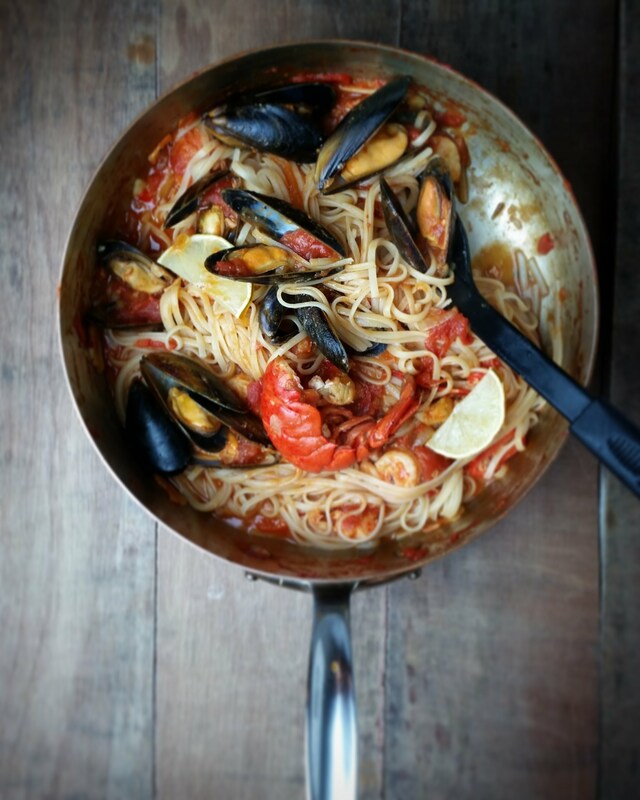 I made Seafood Linguini on Christmas Eve Eve, which I posted on my Instagram account. It went down well, not only on Instagram, but also my throat. So, I’ve decided to share it with you too – a delicious, simple, celebratory dish to start the new year. It’s a take on my King Prawn Linguine and it is of course, right tasty! Try it. Step 1 Heat olive oil in a large saucepan, add onion and fry for two minutes. Add garlic and fry for a minute then stir in tomatoes, sugar and chilli and cook for a further minute. Step 2 In a pan cook the linguini in salted water and cook as per packet instructions. Step 3 Just before the pasta has cooked put the lobster, mussels and king prawns in to the saucepan, stir into the sauce mixture and cook through until the prawns have turned pink and the mussel shell opened. Step 4 Once pasta has cooked drain then combine with the other ingredients in the saucepan and season with salt and pepper to taste. Serve the Seafood Linguine with slices of lemon.